Who needs a vaccine? Find out. Symptoms of influenza can cause mild to severe illness, including: fever, cough, sore throat, runny or stuffy nose, body aches, headaches, and chills. Health Department clinics do not provide primary care. If ill, you need to first call your primary care provider (family doctor) before going to the office and discuss what your symptoms are so the staff there can respond appropriately. Please contact your primary care provider (family doctor) or local pharmacy for flu vaccine locations or click on the link “flu.gov locator” for locations near you. For more information on these requirements and classifications, please visit The Centers for Disease Control website. The Pima County Health Department recommends that you call the participating pharmacy before you go for your vaccine to assure they accept your specific insurance and are able to administer the vaccine for your age group. For a list of vaccination locations near you click on the Flu.gov Locator icon located on this webpage. For additional information regarding the influenza virus call the Disease Information Line (520) 243-7800 or 1-(800) 939-7462. 1.You child is struggling to breathe. It is normal when we’re sick to sleep or rest, but if you can’t get your child to wake during the day or the child is not interacting go to the emergency room. 3.If your child has a high-risk condition, such as heart, lung or kidney disease, or an immune-system disease and is spiking a high fever (103F-105F) seek medical help. 6.If your infant has no tears when crying or has significantly fewer wet diaper for 8 to 10 hours. 7.Any infant less than 2 months old who has a fever over 100.4F. If your child is at high risk of flu complications because of another condition, call your health care provider, otherwise you can probably avoid the emergency room. Try to make children as comfortable as possible at home. 3.Let the fever do its job. However, if your child is uncomfortable try lowering the body temperature with a lukewarm bath (do not use ice packs or alcohol bath) or giving acetaminophen or ibuprofen. Make sure you give the right dose! Talk to your pediatrician or pharmacists for help in finding the right dose. Do not over bundle them. What if my child has a fever over 103, should I bring them in? My child’s temperature recently soared to 105.6 Fahrenheit, and he was uncomfortable so we brought the fever down by alternating doses of ibuprofen and acetaminophen, talk to your pediatrician before trying a combination approach. DO NOT GIVE THEM ASPIRIN – there has been an association with Reye’s syndrome. The medications won’t get rid of the flu, but they may help you and your child ride out the flu with less suffering. If the fever persists for more than three days or if your child develops any of the symptoms above contact your pediatrician. There is nothing we would like more than to make your child feel better. It’s what we’ve dedicated our lives to. When it comes to the flu we are limited in what we can do. Because the flu is a virus, antibiotics like amoxicillin are USELESS. In fact, they are worse than useless and can be harmful if used when not needed. FIND OUT MORE ABOUT ANTIBIOTIC MISUSE AND DRUG-RESISTANCE HERE. While there are antiviral drugs like Tamiflu, there is a very small window at the beginning of the flu where they have limited effectiveness. Usually, by the time your child is exhibiting symptoms, it’s too late. What we can do in the emergency room is help if your child is dehydrated or struggling to breathe. How can we stop the rest of the family from getting sick? 1.Teach your children to cough into their elbows and model the behavior to help reduce the amount of germs flying through the air. 2.Make sure everyone in the family practices good hand-washing technique and washes their hands frequently–after going to the bathroom, before eating or touching their face, etc. 3.Use masks! Stop the droplets. 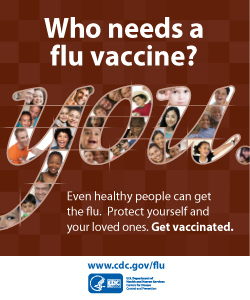 4.Get the flu vaccine. I know, I know, this year’s flu vaccine isn’t as effective as usual, but it is stopping some of the flu variants, AND it may help reduce the length of time you’re affected. 5.Eat well, get plenty of sleep and exercise.